The story that never had to happen! “Hero for Hire” scribe Steve Englehart decided he wanted to steer street hero Luke Cage’s adventures, just for a moment, into the mainstream Marvel Universe. And what better way than by pitting him against the Big Baddie of the MU – Dr. Doom! It could be an epic showdown for the ages. Or something we’ll laugh about for a good long time. 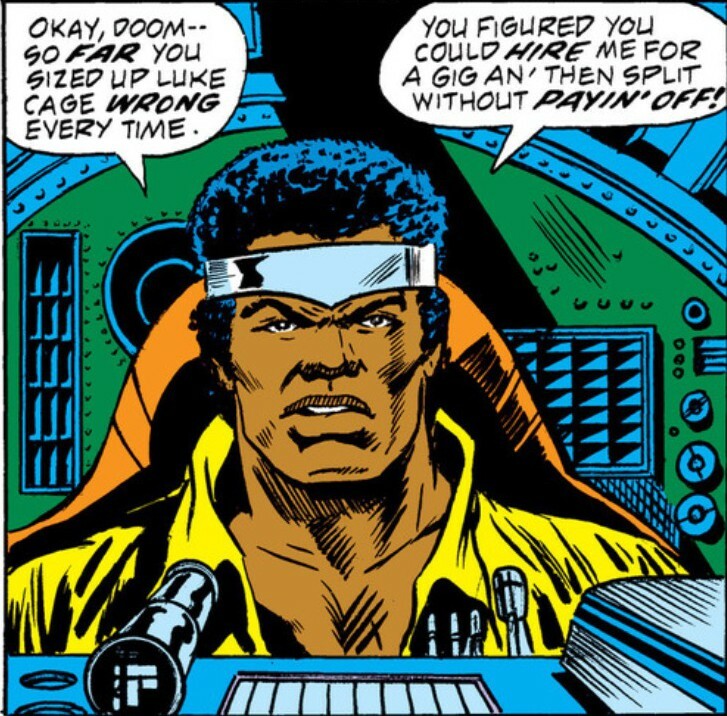 “Luke Cage: Debt Collector” does not have much of a ring to it. In “Luke Cage, Hero for Hire” No. 9, cover date May 1973, “Where Angels Fear to Tread,” Luke storms all the way from the hardscrabble streets of New York to the tops of Castle Doom in Latveria (courtesy of a skycraft borrowed from the Fantastic Four) – all in search of the $200 Luke believes Doom owes him. In the previous issue, Doom, through a middle-man, had hired Luke to take care of some rogue robots roaming the Big Apple. That $200 is about $1,105 in today’s money. You can understand why Luke might be peeved. Nobody stiffs Luke Cage! After fighting his way across the enslaved nation – and somehow becoming part of a robot rebellion with the alien known as the Faceless One – Luke finally confronts Doom. Never has a moment gone so goofy so fast. Maybe Englehart thought the quip was urban. Or cute. Or both. 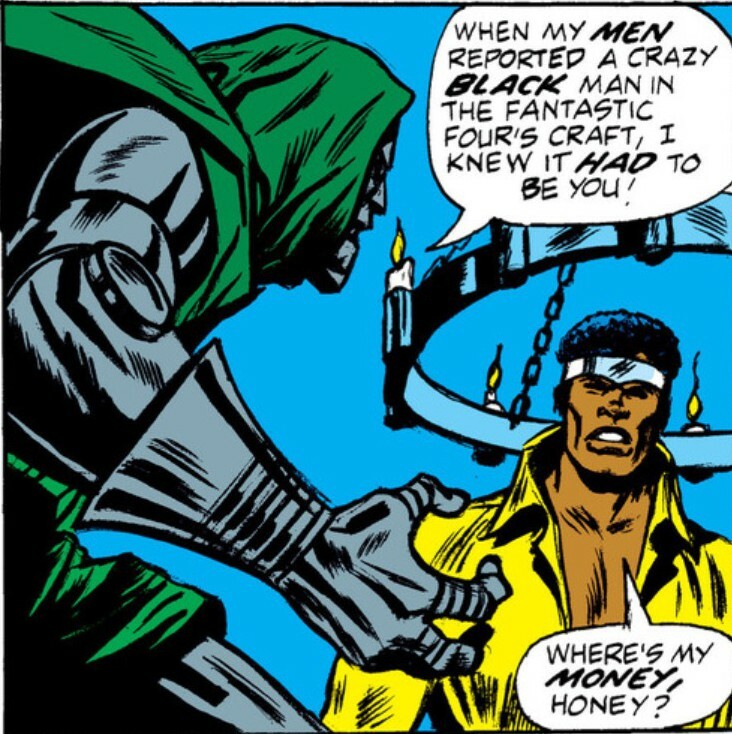 It’s hard to imagine anyone else in the Marvel Universe, from Spider-Man to the Impossible Man, ever being quite so flip with Doom. 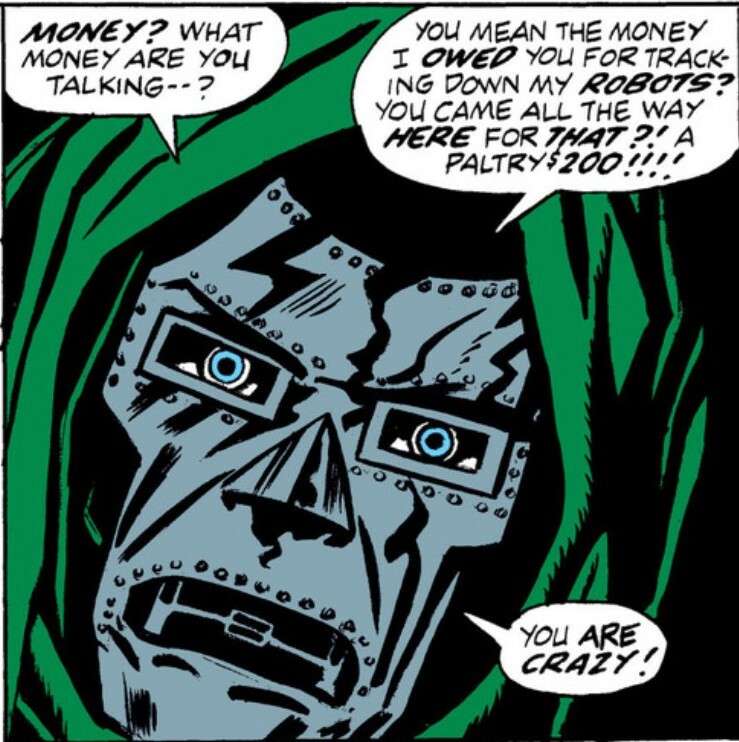 And how does Doom react to this overly familiar manner of debt collection? Sure, Doom says no, but his blue eyes say yes, yes. The two brawl, because it’s a Marvel Comic in the ’70s, and a fight has to break out every two pages, and man, do I miss ’70s comics. When the Faceless One attacks, Luke turns and helps Doom repel the assault, winning his respect – and his money. Call a guy “honey” just once and he thinks he can put his hands all over you. Never mind the cost of the fuel he burned up in the FF’s flier while crossing continents at top speed. Hey, that’s Reed Richards’ problem. 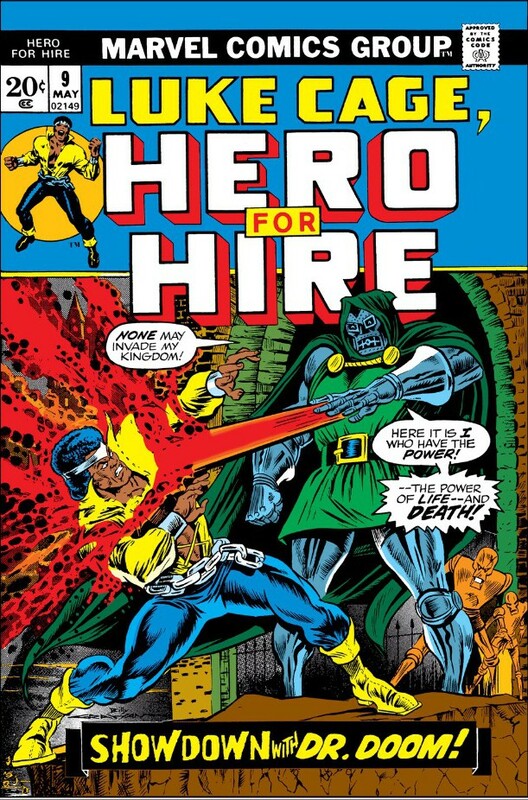 You can find this epic tale in the Marvel Comics app or in “Marvel Masterworks: Luke Cage, Hero for Hire Volume One”. In the very next issue “Hero for Hire,” No. 10, cover date June 1973, Luke faced off against the electro-shock villain Senor Muerte. Those streets sure were a lot meaner back in the ’70s. Dr. DoomLuke CageMarvel ComicsSteve EnglehartWhat the Hell Did I Just Read? It’s understandable. I remember, back in the day, facing off against club owner just as evil as Dr Doom to get my $30.00. I never called them honey, though. Keith, I wonder if we should pepper all our conversations with the Dr. Dooms in our lives with random endearments. If they think we’re crazy enough, maybe they’ll give us what we want. Worked for Luke Cage. It just screams hep cat. How can anyone deny you? Yeah, the Hero for Hire premise just didn’t work. It took Marvel a couple years to come up with “Power Man” and even that didn’t stick so well. 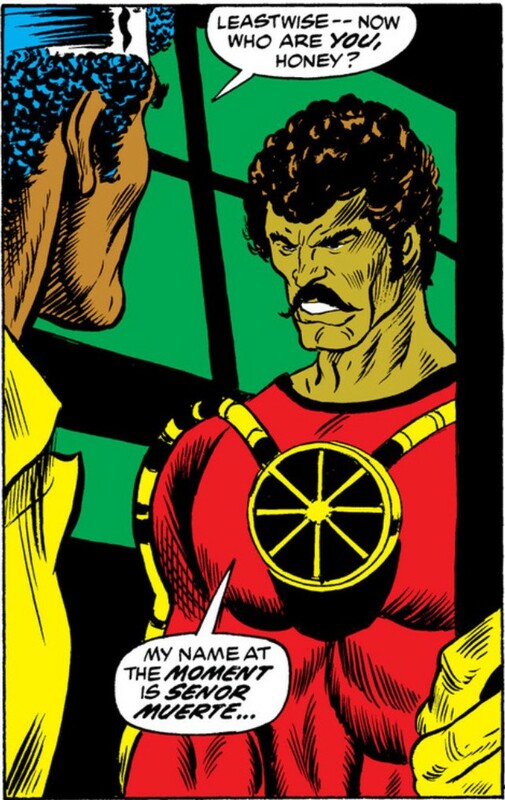 But the ’70s run of Luke Cage has many pleasures to offer.